The Apple Wiki Server is sadly going away. I always liked this service. It was thoughtfully designed and looked much nicer than most of the other tools available out there. Sure, you couldn’t write articles offline, write in markdown, or do a lot of other things that I’ve learned to both love and hate from other solutions, but honestly it always felt the most Apple of services in macOS Server because it didn’t have every-single-checkbox. So, I’ll pour a little Jaëger on the ground in memory of the wiki server and then… export some stuffs and move on. wxr: the native WordPress format that can also be used by a variety of other solutions as WordPress is their reference competitor of sorts. WordPress also has wiki plugins, which you could experiment once you’ve imported all of your stuff. ExpressionEngine, Drupal, and many other solutions support importing via the wxr format. For importing into confluence check out https://wiki.afm.co/display/PUBL/HOW+to+import+Wordpress+into+Confluence which requires you to run your own server temporarily if your ultimate goal is to move to the Atlassian Cloud (which is pretty much what I ended up doing). pages: A folder that stores static html, rather than the dynamic html files that the wiki services builds. You might use this if you just want to take a permanent archive of the wiki service and maybe hire an intern to cut/copy/paste pages into a new wiki solution, like Confluence. json: If you’re going to be scripting a custom import into another solution then json is likely to be your best bet. I blame python. There are more modules than I can count to import that assist with manipulating json. If another wiki or documentation tool has an import option, you can find a way to get it in. You’ll likely encounter broken links, etc. Unless you correct those in the script during import. Which is a lot of logic. legacy: Uses PostgreSQL. Probably not useful for a lot of people. I’ve done some work reverse engineering that database, but it changes routinely and so that work is put out of date at regular intervals. decoded: A more swifty export. 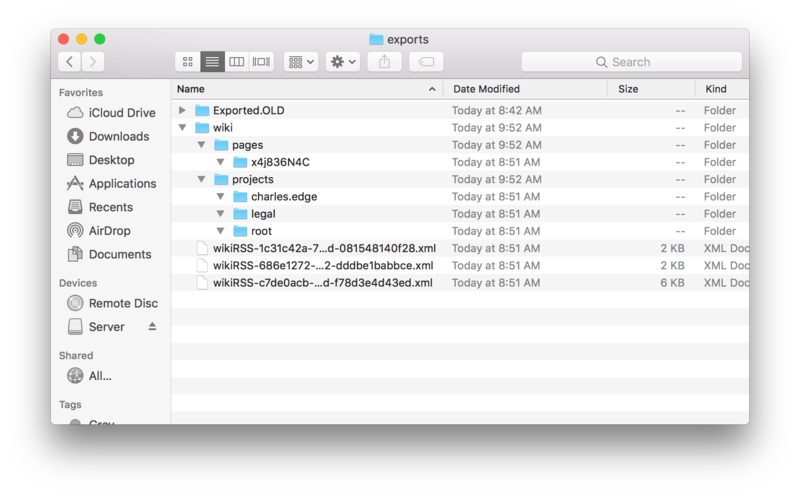 I think I’d just use this if I were building a swift app based on my export. Which I can’t imagine doing. So, for wxr there will be a directory called wiki that doesn’t have much in it. And then there will be an xml file for each user that has a “page” as well as another with all the articles in it. You’ll need to look at them, but typically the biggest and last one exported (so the last one in the directory listing) will have all your articles. Once you have the correct XML file, you can import it! To do so, go to WordPress, hover over tools in the sidebar and click on Import. At the import screen, select the xml file, and then click on the “Upload file and import” button. Note: If the import fails, you may have to edit your php.ini to increase post_max_size or upload_max_filesize. But once the import is complete, I’d change those back to the defaults. wikiadmin returns a status code of 0 for success. In the event of failure it returns a non-zero status, and writes error messages to stderr. The name of the bundle created when exporting wikis for formats other than pages. new wikiadmin still supports importing from the older export formats. Thanks! Any magic migration abilities in 10.6.5 server? Before I donate it to a museum (the museum is the sea). Thanks for that. Have a music wiki for my studio in server 5.2 on a MacMini server running El Capitan and want move that to WordPress. The wxr option does not exist in that version, but I’ll try to export via JSON and then import it with a JSON convertor in Progress. Any experience with that?